Here in Anna Angelou Page 3, you will see another creation by Anna. Anna mainly uses Painter and Print Shop, two computer programs, to create her cards. Anna said that she started doodling in Painter a few years ago on her own and began creating BMP files with that simple program. From there, her daughter who is a graphic and fashion designer gave her PC Paint and from then on she started creating computer art. In the beginning she used any program to make cards including Microsoft Word. Then she bought Painter which she said is a great program. Then, everyone around her encouraged her to pick up her pencil and draw on paper which she did. She said that she never really knew that she could do it. Now Anna sketches her work then scans and paints in the computer program, Painter. She draws every morning before she goes to work and also any moment whenever she finds the time and opportunity. This next card is her own creation of "children of the world"(c). She explained that she sketched this in pencil and scanned and drew in Artist using mostly water color and chalk. 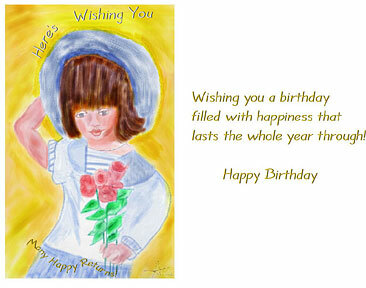 Then she imported into Adobe Illustrator for the card which is in two parts. 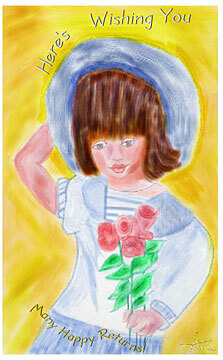 Here is the front view of the computer generated card by Anna with her drawing of a little girl carrying a bunch of roses. And here above is the inside of the card with the message written by Anna.